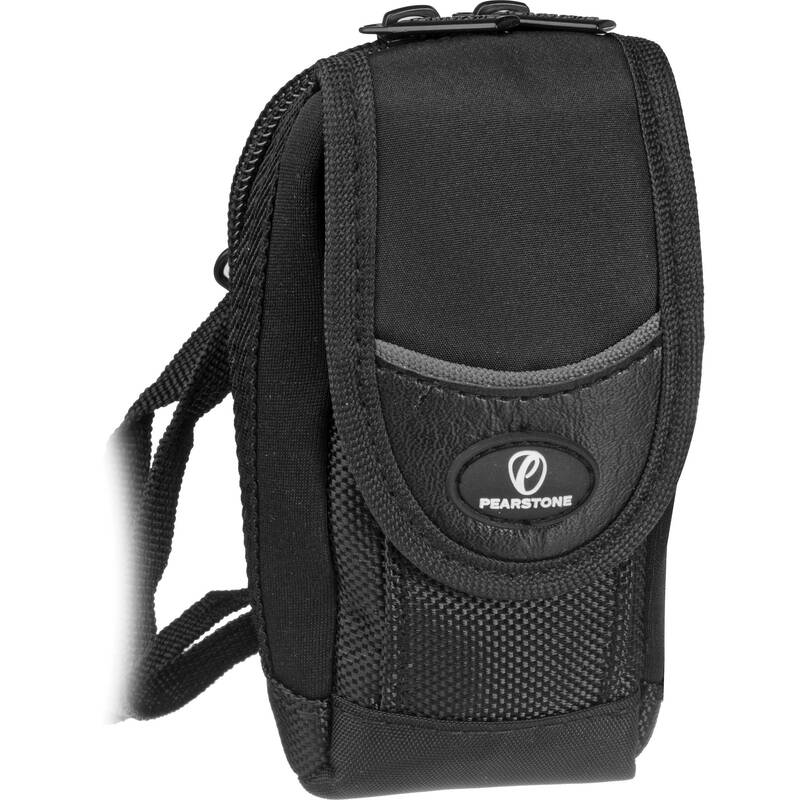 The black Onyx 240 Camera Pouch from Pearstone is the perfect way to carry around that small digital camera you just bought. This is a rugged and reliable pouch made from weather-resistant 600 Denier ballistic nylon that will keep your camera safe should you get caught in inclement conditions. The pouch is accessed by two strong, self-healing zippers affixed with strong metal pull tabs. The exterior features a touch fastened pocket in which you can store an extra battery or a memory card or two. Once inside the pouch, you'll find a soft, padded velveteen lining that will not mar the finish of your camera as well as keep it safe from incidental contact. The pouch itself is supported on each side by two strong elastic nylon bands. In addition, there is a small velveteen pocket in which you can store an additional, small memory card. Carrying the Onyx 240 is easy since it comes with a fully adjustable and removable shoulder strap. Further, when you want hands-free operation, the pouch contains a rear wide belt loop that is attached with both touch fastener and strong snap closure. The Onyx 240 is a very reasonably priced pouch that will provide your camera with the protection it deserves. With its handsome Pearstone logo on the front it is backed by a limited 3-year warranty. Box Dimensions (LxWxH) 8.8 x 4.2 x 2.3"
Onyx 240 Camera Pouch (5.3 x 2.25 x 1.3", Black) is rated 4.3 out of 5 by 27. Rated 4 out of 5 by Adrian from Works OK with Ricoh GR; not most compact This came bundled with a Ricoh GR camera, and fits it snugly. In addition to the main compartment, there is an outside pocket that can hold an extra battery and SD card. The outside pocket and the belt attachment system add bulk so that this would not be my first choice of pouch for carrying this camera in the mountains. The Ricoh GR will fit fine in a size small Mountainsmith Cyber bag which has a cleaner profile and is designed for attaching to backpack shoulder straps, rather than a belt. The Cyber is a few grams heavier, though. Rated 5 out of 5 by 2r from Right size for my new camera, Canon SX720 Hs Very convinient for the camera, battery and memorycards. Rated 3 out of 5 by Anonymous from Bulky for a small pouch Good construction. Velcro belt loop makes it easy to clip on a belt. Has a battery pocket and a sleeve for SD cards. It fits my Panasonic ZS40. The extra pocket and the velcro flap that closes it makes it a hair over 3 inches deep, very noticeable when wearing on my hip. It may not be a problem for some but I was looking for something more minimal. Rated 4 out of 5 by Marin Meanderer from Nice but bit narrow for Lumix ZS40 This Pearstone Onyx 240 pouch/case was purchased because it was a recommended accessory to the Panasonic Lumix ZS40 camera on the B&H website. It's a nice design, seems durable, with 1 mesh pocket on the inside and 2 compartments under the flap on the outside, either of which can easily hold an extra battery or memory card. I like that the zippers go almost to the bottom on each side, allowing for wide opening, and it has inside elastic gussets which would help prevent a camera falling out even if the case was unzipped. Also nice is the way the belt strap completely opens for easy attachment (probably most pouches these days have a similar design). The side-to side fit of the ZS40 (depth of the case) is fine, but the top to bottom fit (width of the case) is tight. I use my camera a lot while hiking in a group and I have to be quick so I don't fall behind. To put the camera in this pouch you have to take a few seconds longer than what should be necessary to push it all the way in and make sure you don't scratch the camera when zipping. It would make a fine case for a camera not quite as tall as the ZS40. Unfortunately, B&H doesn't seem to sell the Synergy SCD-23 case which I found after purchasing this Pearstone case. The ZS40 fits easily in that Synergy case and even though it only has one storage compartment, that's all I need. In general, I'd recommend the Pearstone Onyx 240 for a smaller camera or for someone who doesn't mind extra care in removal and replacement. Rated 3 out of 5 by Anonymous from OK but not great This case protects the camera and has places for extra goodies. However it's not all that convenient to get the camera in and out of compared to others I've owned. Rated 3 out of 5 by Kaykay from Just okay The pouch produced much lint and I had to constantly wipe it of my camera before I opened it. will this case fit a canon powershot elph 190? Yes, the Pearstone Onyx 240 Camera Pouch would be compatible for use to hold the Canon PowerShot ELPH 190 IS Digital Camera. As listed under the Specifications for the items, the Canon PowerShot ELPH 190 IS Digital Camera's dimensions are 3.8 x 2.2 x 0.9 , while the Pearstone Onyx 240 Camera Pouch's interior dimensions are 5.3 x 2.25 x 1.3 . It is large enough to hold your camera. Will the pearstone onyx 240 house the Lumix ZS50? Yes, the Onyx 240 will fit the Panasonic Lumix ZS50. Can this item be purchased in red?Am forever misplacing everything? &amp; red is much earlier to see. The Onyx 240 was not available in red. Will this fit the Olympus TG-4? It will be a snug fit, but it will fit. My DMC ZS40's dimensions are 4.35 x 2.53 x 1.35 inch and it fits in the pouch. The Olympus TG-4's dimensions are 4.4 x 2.6 x 1.2 in; a little wider and thinner than the DMC ZS40. My DMC fits in the pouch snugly; how snugly depends on how big the object you put into the compartment in front of the main compartment. It is a soft pouch so it flexes a bit to accommodate.